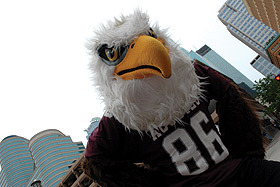 For the last couple of years, Augsburg's summer orientation program for incoming first-year students has focused on introducing new Auggies to the neighborhoods surrounding campus. During SOAR, both students and parents take neighborhood walking and light rail tours and not only see the areas but also learn some of the history and lesser-known facts about the neighborhoods. In this spirit, we asked several Auggie faculty and staff to share their "You have to see/do/go to..." suggestions for getting to know our cities. If you don't find an adventure here that's to your liking, ask a coach, professor, staff member, or another student for their ideas—or offer up some of your own! From Augsburg take Riverside to Franklin to west River Road, down to Minnehaha falls. Then, Minnehaha creek to the Chain of Lakes to the Midtown Greenway, over the Sabo bridge, to the trail along the LRT, then back to Augsburg. Augsburg to Uptown and back via the Midtown Greenway, and then perhaps around Lake Calhoun. Also Uptown to Downtown via the Kenilworth Trail and Cedar Lake Trail. If you're not sure what any of this means, find great bike trail maps on the City of Minneapolis website. Grand Avenue, stretching from Fairview Ave all the way to Dale where you can find many small restaurants and boutiques. For restaurants on Grand, Shish: A Mediterranean Grill is worth a visit; and Cafe Latte on Grand and Victoria is a requirement- it's a true St. Paul institution, famous for its desserts and soups. One block from Grand is historic Summit Avenue where some of the largest, prettiest mansions of St. Paul's "old money" elites stand. University Avenue from Lexington Avenue to the Capital Building in St. Paul is a wonder of small (mostly Asian) ethnic eateries. If you made it a goal to try each one, it would probably take you at least 6 months. This area also currently displays the photographs of artist Wing Young Huie, who published Lake Street, USA. And finally, everyone is talking about the Lowertown neighborhood of downtown St. Paul. It's had a recent renaissance of condominiums, theaters, galleries and new restaurants. Mears Park in that area is charming and has many free concerts. Generally, downtown St. Paul has many fine examples of turn-of-the-century architecture in contrast to Minneapolis's more modernist downtown. The architectural detail on the older buildings is exquisite. Both Laurel and David, and many other Auggies, suggest visiting and becoming a member of the Seward Co-op. Not only for the beautiful produce and wonderful array of organically grown and naturally-produced items, but for the lunches you can grab to go...nutritious, delicious, and oftentimes unique. Take the light rail to Minnehaha Falls and rent a 2 or 4 (or more) person bike. Visit the sculpture garden at the Walker Art Center at dusk. See the spoon, check out the metal horse and make a wish at the fish pond. Ann encourages you to check out some of the parks and architecture our cities have to offer. She suggests: Minnehaha Falls, Indian Mound Park (St. Paul river bluffs), the State Capitol building and grounds, Downtown Minneapolis skyways, and the Milwaukee Avenue houses that are across I-94 just off Franklin Avenue between 22nd and 23rd. Rebecca John of the department of marketing and communication agrees about the Milwaukee Road houses. "It's like stepping back in time to walk along that bike- and pedestrian-only street. I know of nothing else like it in the entire Twin Cities!" There are a lot of large and small theatre venues in the metro area. In addition to attending (or getting involved with) one of several Augsburg Theater Department productions throughout the academic year, Darcey recommends seeing a production at The Guthrie or Ten Thousand Things Theatre. She also suggests going to Open Eye Figure Theatre to see some original work by Michael Sommers. She says, "I promise you that you won't be disappointed. You will experience something you've never experienced before." I love the Minneapolis Institute of Arts (aka MIA) at 2400 3rd Avenue South (just a few blocks south of Franklin Avenue). A person could spend all day there, and admission is FREE every day for the general exhibits. Walk down Nicollet Mall from the IDS Building to Loring Park and then try to get back through the skyways! Take the Minneapolis Queen boat ride through the locks on the Mississippi to get the best view of downtown Minneapolis and learn about our Mill City. Stop at the Mill City Museum afterwards for more fun info. Go to Lake Harriet for a Sunday afternoon picnic and stay to watch a concert in the bandshell. It was the most impressive thing I planned for a family reunion last year! Minneapolis and St. Paul have incredible farmers' markets that stay in business well into the fall months. Look for one in your neighborhood on the City of Minneapolis website. And don't forget Augsburg's market in connection with the Brian Coyle Center market held on Tuesdays. Watch your email and the Daily A-mail for more information including recipes! Pizza Luce – several locations with fantastic pizza, sandwiches, and pasta including the Lasagna Abruzzi, a cheesey, meaty mouthwatering caloric dream. Closest to Augsburg is on Franklin across the I-94 footbridge. Café Latte – St. Paul on Grand Avenue and Victoria. Lots of great shopping nearby and some of the best desserts you can find! Maashaa'Allah Restaurant – 605 Cedar Ave South. Incredible gyros and other African food all for great prices. Victor's 1959 Café – Grand and 38th in South Minneapolis. A tiny Cuban place with a fun, casual atmosphere. It has really great food including plate-sized banana or chocolate chip pancakes. Maria's Café – 1113 East Franklin Avenue. Great breakfast and lunch and some delicious coffee! Galactic Pizza – Lyndale Avenue in Uptown. Fresh, local ingredients and superhero delivery drivers in 3-wheel electric cars. Eat pizza and save the environment! Himalayan Restaurant – 2401 E. Franklin Avenue, a great buffet at a great price! Red Stag – 509 First Avenue Northeast. A supper club with a contemporary flair that seems to have captured some old essence of Northeast Minneapolis. They also have great live music. Psycho Suzie's – 2519 Marshall Street NE. Show your tattoos and piercings at this hip, young bar and restaurant with great pizza, mini corndogs, deviled eggs, and other delectable treats. Great outdoor patio too!